As a smartphone flagship model running on WP8 system, the mysterious veil of Lumia 920 has been removed. It is inevitable that users will put Lumia 920 and Lumia 900 into comparison, including the screen display quality, photography effect and user experience. In the following, we can get access to what Lumia 920 differs from Lumia 900. 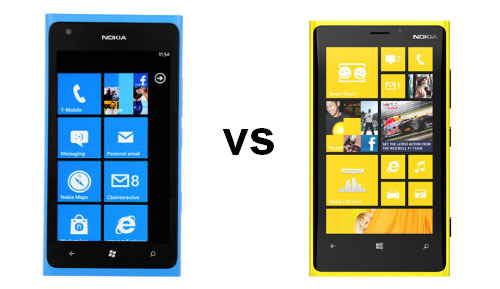 Nokia Lumia 920 continues the integral design of Lumia 900 in appearance, only a few differences in details: the main color is changed from lake blue to bright yellow, the micro-USB interface is moved to the bottom of the phone. With larger touch screen and more powerful hardware configuration, the weight of the phone increases from 160g to 185g. However, the function improvements do not increase its thickness, the 10.7mm is even thinner than Lumia 900 which brings with better user experience. Nokia Lumia 920 touch screen has been upgraded greatly: it adopts 4.5-inch PureMotion HD IPS touch screen which owns the features of high resolution, high screen brightness and high refreshing speed. At the same time, there is groundbreaking innovation in touch induction. For example, the touch screen resolution has reached 1280 x 768 (WXGA) specification, and the pixel density is as high as 332ppi, which have surpassed the main competitors in the current market. In addition, the PureMotion technology adopted by Lumia 920 makes it performs much better in screen induction ability. You can complete all mobile phone touch operations even you are wearing glove, using your nail or etc. Besides keeping the 8-million-pixel standard with Lumia 900, the second generation PureView photography technology is added to Lumia 920 as well. By taking advantage of advanced optical anti-shake technology, Lumia 920 can intake light five times as other smartphones. It claims to the first smartphone that integrates optical image stabilization system. In order to improve the image quality in weak light environment, Lumia 920 employs backside illuminated sensor as well as f/2.0 aperture Carl Zeiss Vario-Tessar which allows better image shooting in cloudy day, evening and indoor. Furthermore, compared to the previous anti-shake function, optical anti-shake function appears in Lumia 920 that enables you to gain clear and sharp image even in dim light. 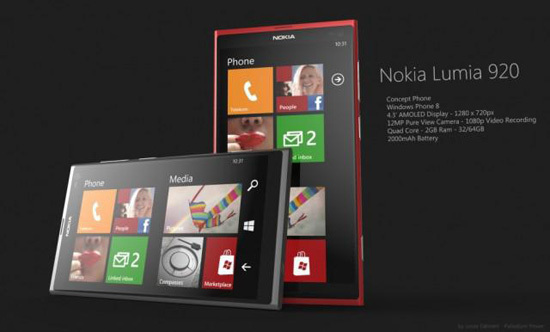 Lumia 900 cannot be upgraded to the newest WP8 operating system which has been adopted by the current Lumia 920. For winning more fluent control experience, the built-in processor has been upgraded to 1.5GHz Qualcomm Snapdragon S4 dual-core processor and the RAM has been increased from 512MB to 1GB. 32GB storage space is provided by Nokia Lumia 920. In software applications, this phone is pre-positioned the “Nokia City Kaleidoscope”. Users only need to position the camera to the corresponding streets, then getting the information of restaurants, hotels, etc.. In order to get more ideal standby endurance ability, Nokia Lumia 920 built-in battery capacity has been increased from 1830ma to 2000ma, which will provide more ideal standby in theory. Simultaneously, another highlight of Lumia 920 lies in the support of wireless charging: with the aid the embedded magnetic stripe and wireless charging tray so as to achieve wireless charging. Other features in Lumia 920 including NFC function, V3.1 BlueTooth, 1080p video capturing ability.